Cover: SW Second Ave Bridge looking south in 2000. The cover photo is a picture of the second SW Second Avenue Bridge in September of 2000. At the time of the photo, the bridge was already scheduled for replacement. The predecessor to the bridge in the picture was built in 1896 by Henry Flagler and was called the Avenue G Bridge. The bridge was named for the avenue in which it supported. Avenue G was part of the naming system prior to the Chaille plan implemented in 1920. 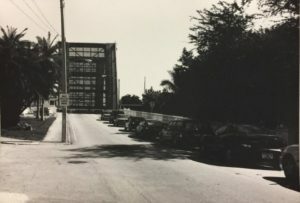 It was the first bridge to span the Miami River. 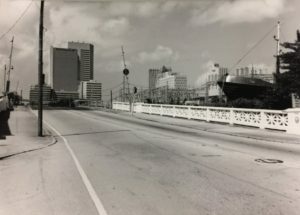 The pictures in this article were part of a project to document the buildings and surrounding area on the north side of the Miami River to the east of the bridge. The Brickell Shipping and Production Company occupied the property that once belonged to the Miami Shipyards. The land and buildings also served the Miami Shipbuilding Corporation prior to the Miami Shipyards. Figure 1: SW Second Ave Bridge looking north in 2000. Planning for the replacement of the bridge in the picture began in 1990. However, the project did not begin until 2001. It was completed in 2003. The bridge was designed in a “no frills, no bells and whistles motif” according to the chief engineer for the project, Bill Junkin. It was crafted to be functional and efficient when interrupting automobile traffic across SW Second Avenue. The specification called for the bridge to open and close in 65 – 70 seconds. It is a full 10 seconds faster than the Brickell Avenue Bridge. The 1924 era bridge was dismantled in 2001 and used as an artificial reef at the bottom of Biscayne Bay. It served Miami for almost 80 years. Its predecessor only lasted 28 years. In his book ‘Miami Memoirs’, city pioneer John Sewell referred to the original structure as “a poor apology for a bridge”. Figure 2: SW Second Ave Bridge in up position in 2000. Read more information at “Miami Vice Shipyard“. Miami Herald: “Miami River Bridge Crosses into New Era”, November 28, 2001. Survey: “Historical Documentation Survey of the Miami Shipbuilding Corporation Office / Lavatory Building”, Janus Research of Saint Petersburgh and Coral Gables. Courtesy of HistoryMiami. Book: “Miami Memoirs” by John Sewell. Cover: SW Second Ave Bridge looking south in 2000. Courtesy of HistoryMiami. Figure 1: SW Second Ave Bridge looking north in 2000. Courtesy of HistoryMiami. 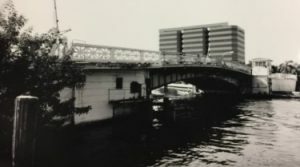 Figure 2: SW Second Ave Bridge in up position in 2000. Courtesy of HistoryMiami.